Want to add the spice of marsala to your life? I think dashes of this color in a neutral kitchen would be gorgeous. 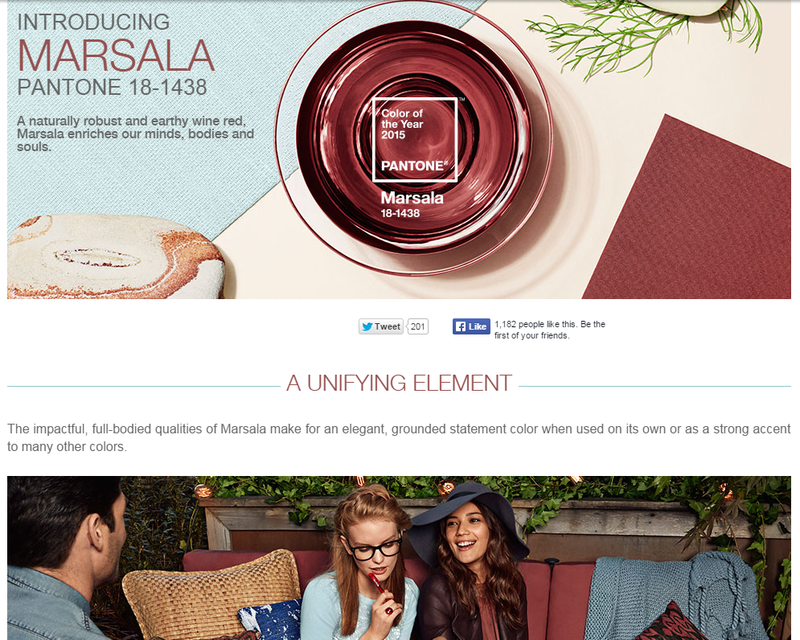 I especially like the idea of a marsala-hued blouse and a swipe of marsala lipstick on the kisser. A throw pillow is also a great way to bring in the marsala. AkzoNobel (a huge global paints and coatings company) declared copper orange as their color of the year. Bring my smelling salts! You know I love anything copper. 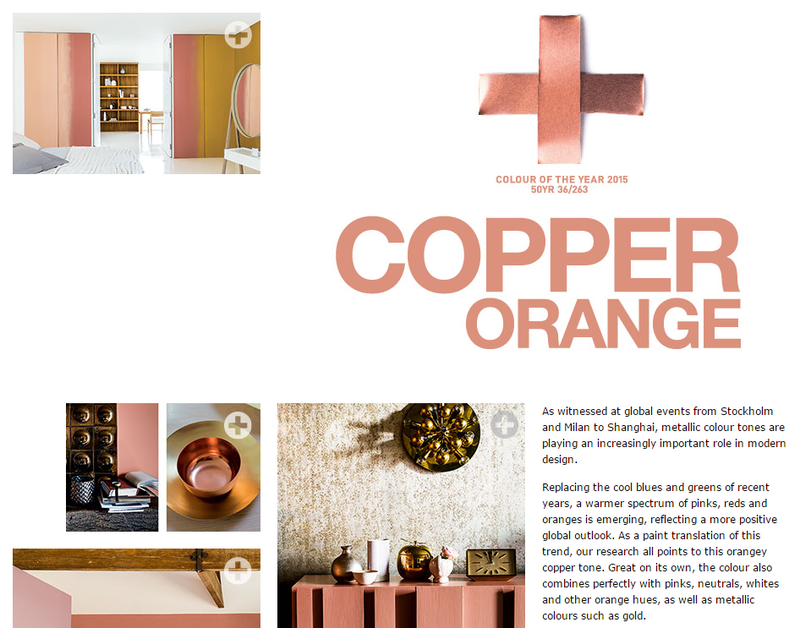 The hue that AkzoNobel chose is a warm and toasty, coppery peach – it's almost rose gold in a way. While I prefer to scatter actual metallic copper accents around my abode, I'm curious to see how others integrate this color into their decor. It seems a perfect shade for the mid-century modern lovers. In fashion and in interior design, I think this copper orange will be versatile and flattering. I love a copper eye-shadow (it's my daily go-to), but now I'm toying with the idea of a coppery lipstick. A copper orange blouse with just a bit of silky sheen could be the start of a glitzy New Year's Eve getup – or look lovely under a blazer for the office. Move aside rose gold – copper-hued jewelry may be stepping in as a trend. My favorite place to use copper would either be the kitchen (love those measuring spoons! ), my bar cart (isn't that a fab platter? ), or the office (the copper coating gives those wire baskets a feminine touch). 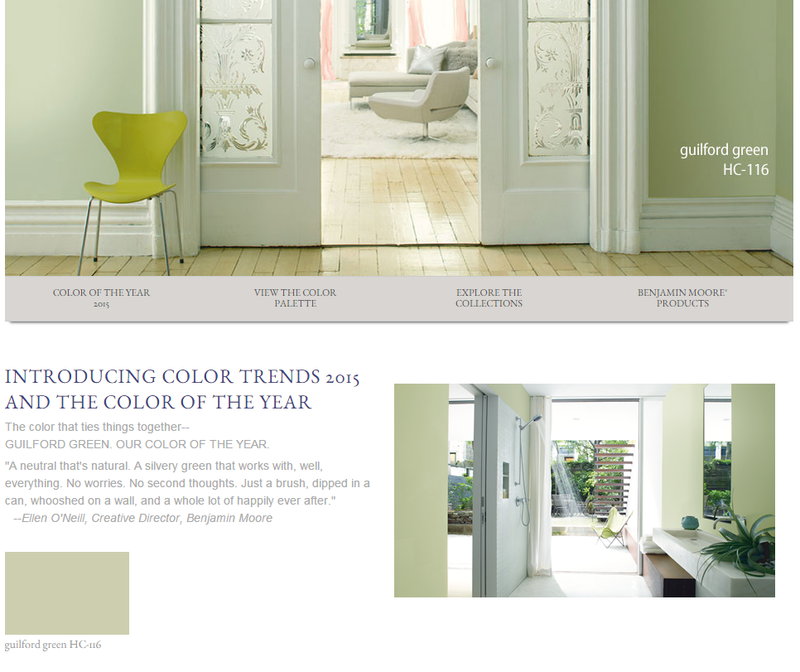 Benjamin Moore went in a fresh, lively direction by announcing Guilford Green as their color of the year. Lush green can get dense and overwhelming quickly, but this pale hue has all the right amounts of springtime and sageness to make it a classic, plays-well-with-others color. Depending on what you combine it with, it could blend in as a backdrop or steal the spotlight. This color really makes me pine for springtime (even though winter has just barely set in). First off, I'd love to wear it. How cool are those retro sunglasses boasting the guilford hue in their lenses? And the subtly military-esque blouse would be great weekend wear. A simple clutch in this color would add a fresh pop of green to any outfit. Better yet, an adorable cross-body purse would, too. Around the home, I'd dabble this green in accents on throw pillows and candles. 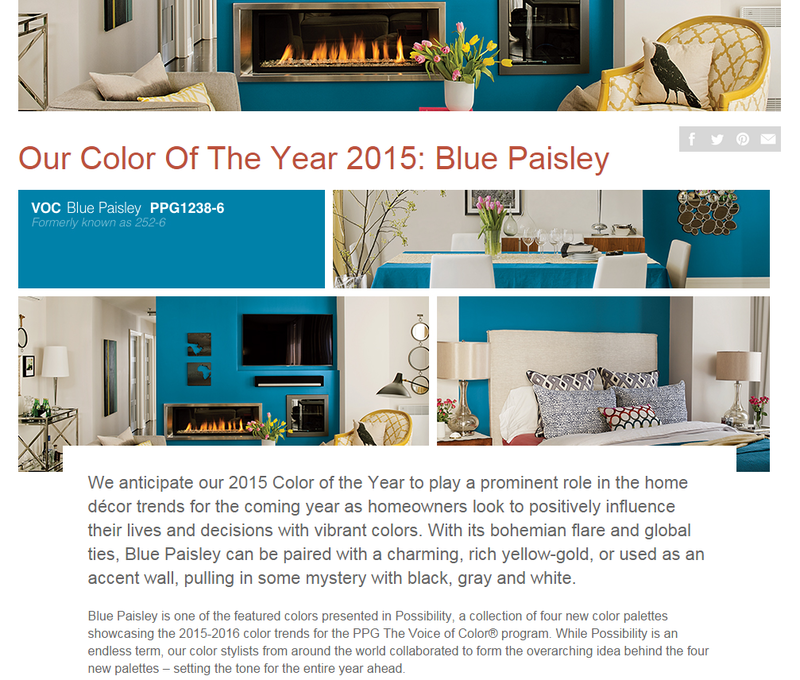 Pittsburgh Paints / PPG Voice of Color has named blue paisley their color of the year. And I'm swooning over it. It's a bold, saturated blue with the slightest tinge of green to make it reminiscent of some of the blue hues that catch the eye in a peacock's feather. It's simply gorgeous and if I hadn't already pick out all the colors for my apartment walls, this would have been a prominent contender. would be just as show-stopping as a little red dress. I'd smudge a bit around the eyes for a smokey evening makeup look. I'd attempt to wear this fabulous patent blue heels. Accent furniture, throw pillows, and kitchen wares – I'd use this blue just about anywhere. 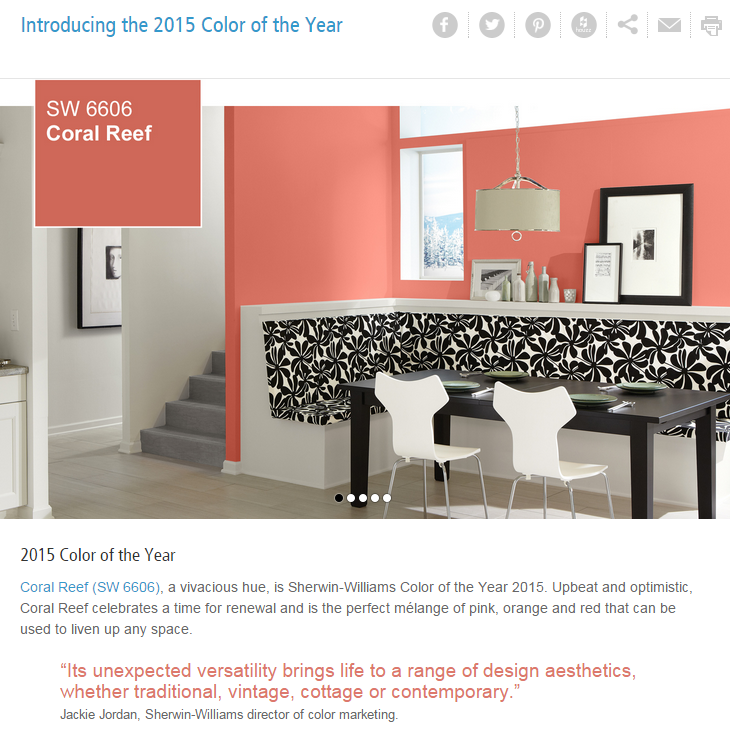 Last but definitely not least, Sherwin-Williams' color of the year is coral reef. (Yay! Coral for the win!) I'm actually painting my front entry room coral, though my coral leans a bit more toward the pink and bold end of the spectrum. Coral is one of those classic colors for me that never goes out of style, so I'm psyched to see it anywhere and everywhere this year. I'd use this juicy color anywhere in my wardrobe or apartment. (Not only is it going in my entry room, but it will also be making an appearance in my bathroom.) Coral would be a fun, unique color for a ladylike coat – as well as on fingernails or the face of a watch. I'd love to track down a beautiful coral blush. A coral tray would look great on my bar cart. Or this coral and ivory bowl would look adorbs in my bathroom. Which of the colors of the year is your favorite – for your home and for your wardrobe?